Everything for an effective and careful nephritic cleaning - natur-apothekes Webseite! Recommendation: Adults 1-2 capsules per day. You carry out the nephritic cleaning - according to state of the kidney - 3 to 6 weeks. Besides, it is important that you drink a lot - possibly 3-4 litres per day. 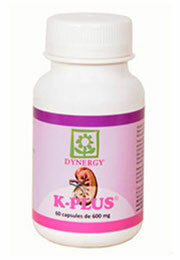 Product effect: K-Plus improves the nephritic function, works with kidney infection and cystitis, cleans the kidney, works against bacteria and prevents kidney stones. Healthy and ill kidney: The kidney is above all a decontamination organ; she filters the blood, regulates the water household and has influence on the blood pressure. A no more fully functioning kidney can cause back pains in the waist and pelvic area, headaches, gout, skin deseases and pains in toes and fingers. Almost all nephritic diseases relate to a hyperacidity of the body. 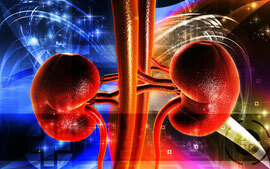 The kidneys perform the biggest part of the removal work of injurious acids from the body. If substances like oxalate and uric acid do not become eliminated fast enough, they can crystallise and form stones. Here bacterias can settle themselves and the removal is more complicated. The solution: Clean and maintain your kidneys with effective and regenerative herbs, so that all waste materials, acids and toxic substances can be taken away efficiently from the cell system.